Two P-38s flying echelon formation as part of a planned photo flight from the LA County Air Show to Chino, Calif. The fifth annual Los Angeles County Air Show at Gen. William J. Fox Airfield in Lancaster, Calif. — appropriately titled ‘First, Fastest and Farthest’ — was sponsored by Lockheed Martin and had as much action on the ground as it did in the air. 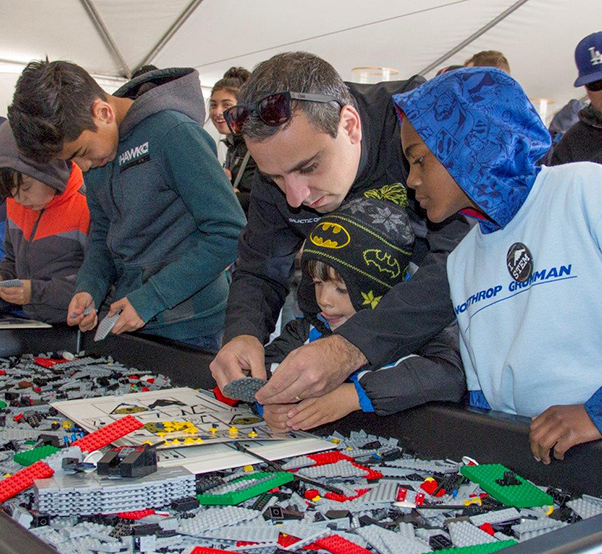 Kids of all ages filled STEM tents to fly aircraft demonstrators, color their favorite airplane and even build jets using virtual prototyping. Undoubtedly, many left with a newfound desire for science, technology, math and art. 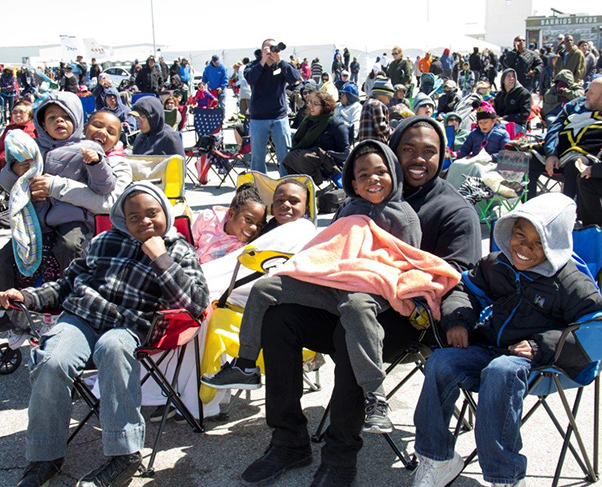 “My husband and I come for the aerial acts but my kids can’t get enough of the STEM tents,” said Janice Travis from San Diego, while her children Jessica, 5, and Danny, 11, entertained themselves in the Northrop Grumman STEM tent. “I only wish there was a place like this that was open every weekend.” Her husband, Daniel, a plastic surgeon, said that the highlight for him so far, was listening to Joe Kittinger, Art Thompson and Alan Eustace share their adventures of free falling from space and Bob Gilliland, the first man to pilot the SR-71 Blackbird. “These guys are the real deal, right here — it’s pretty cool!” Daniel said he was happy to see that the aviation legends were so humble and approachable. History panels were led by Army veteran and author, Dennis Anderson. While some guests enjoyed inside activities, others bundled up as they watched classic aircraft, aerobatic flying, parachute jumpers and the famed Red Bull Team. 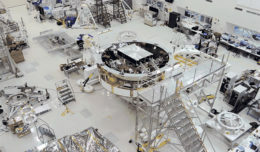 “It just goes to show how dedicated aerospace fans are,” said volunteer, Cathy Hart, speaking of the cool temperatures. Who is that boy? 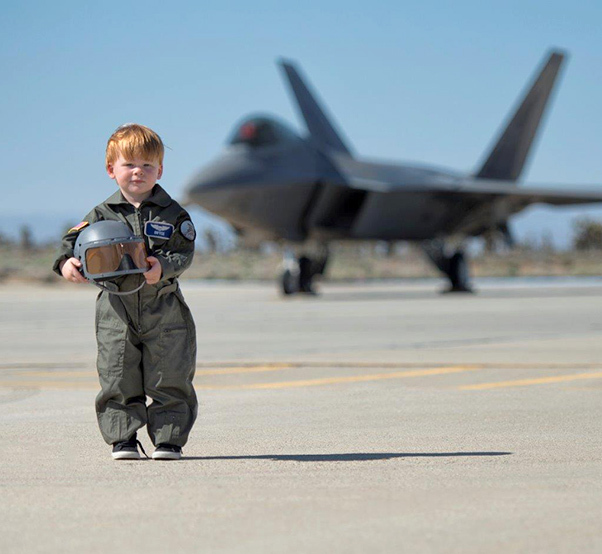 Bryce Sanden, 4, is the grandson of Bob and Cathy Driver, both Lockheed Martin employees, who host the Photo Tour at the LA County Air Show at General William J. Fox Airfield. This photograph was taken during Family Day at Plant 42 and became an instant hit and is being used in print advertising and billboards. Bryce now sits alongside legends and autographs photos drawing a smiley face until he can master his penmanship. Guaranteed a front row seat and special access to the aircraft and performers, participants of the Photo Tour walked away with numerous prize photographs. “Since we work around aircraft every day and see them flying, we sometimes take them for granted, but seeing them never gets old,” confessed Cathy Driver, a Lockheed Martin employee who works at Edwards Air Force Base on the F-35 program. She and her husband, Lockheed Martin graphic artist, Bob Driver, hosted the tour. Guests came from as far away as Germany, Japan and Canada, while many were from the Santa Clarita photo club. 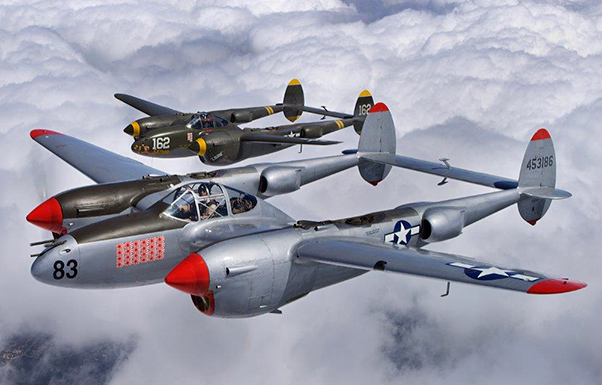 Lockheed Martin photographers Jonathan Case and Michael Jackson had a rare opportunity to take photographs out of a B-25 named Photo Fanny, capturing two P-38 Lightings flying from Planes of Fame to Fox Field. Being a huge fan of aviation and getting to fly in Photo Fanny while taking pictures of two Lockheed legends in close formation through the removed escape hatch, was a dream come true and an incredible experience for Case. He said he had to keep pinching himself when they arrived at the airfield to load up and go fly. Cold weather and high winds could not keep loyal aviation fans away from the Fifth Annual LA County Air Show at General William J. Fox Airfield in Lancaster, March 24-25, 2018. President of the Airshow, Ronda Perez, said there was a 10 percent increase in ticket sales over last year. Shortly after takeoff, Case crawled down the tail with his gear and sat in the tail gunner seat to watch the P-38 Lightnings join up. Case thinks everyone’s nine-year old self comes out when they see this team do what they do. Even when looking at the photos he took, he still asks himself if it really happened. Wrapping up the show, the F-22 Raptor took many spectators by surprise by its outstanding performance. Kids of all ages enjoy STEM tents where they engineered various contraptions using simple materials that they can find at home. They also had opportunities to fly aircraft demonstrators, color and drive robots. John Fergione, LA County Air Show Administrator, thanked the volunteers who made the air show possible. 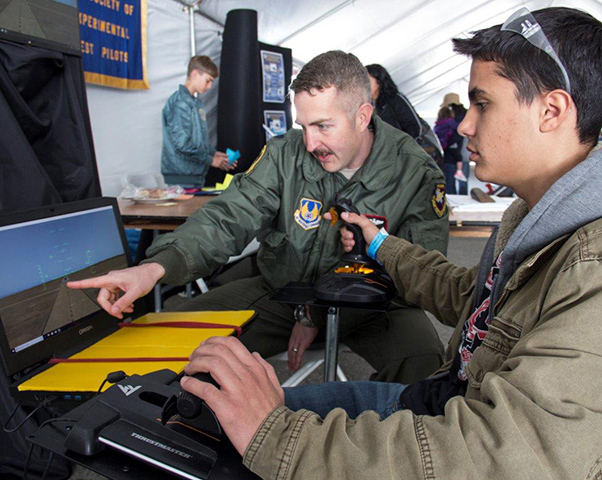 Lt. Col. Paul Calhoun Command of the 418 Flight Squadron at Edwards Air Force Base teaches Rosamond High School student, Wesley Karkiewicz, 17, how to maneuver an F-4 during the 5th Annual LA County Air Show at General William J. Fox Airfield. Karkiewicz started the robotics program at his school and plans on becoming an Air Force fighter pilot. 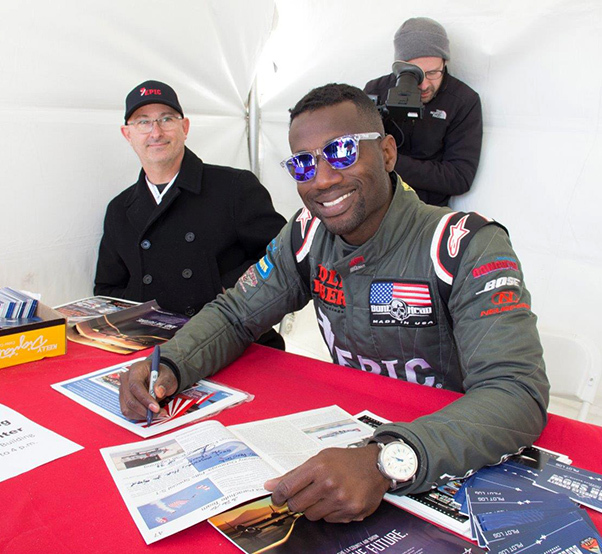 Anthony Oshinuga signs autographs at the 5th Annual LA County Air Show after performing in his Pitts Special S-1. “Black Hawk.” The son of Nigerian immigrants, Oshinuga made history as the first African-American pilot to enter the Reno National Championship Air Race and earn a podium spot.